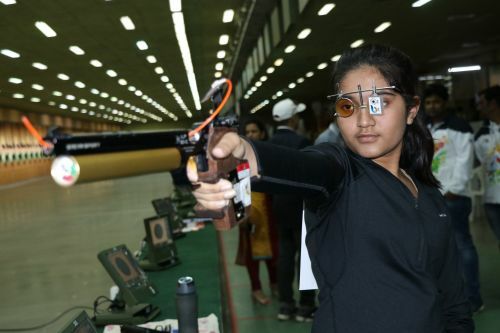 Pune, January 17: The growing stature of shooting as a sport in India was amply reflected in the quality of competition and intense battles for the 19 gold medals on offer in the shooting ranges in the Khelo India Youth Games 2019 at the Shree Shiv Chattrapati Sports Complex here. That as many as 11 States won at least one gold medal is also an indication of the widespread popularity of the sport. There were many wonderful memories made in the competition: Mehuli Ghosh’s duel in the girls Under-21 10m air rifle with Elavenil Valarivan was glittering in its intensity; Dhanush Srikanth, who became the only hearing-impaired athlete to win gold, walked into many a heart with his skills and endearing smile. The beautiful diversity in the Trap gold winners, Manavaditya Singh Rathore and Manisha Keer in the boys Under-21 and girls Under-21 sections was there for all to see. Manavaditya is the son of Olympic double trap silver medallist and Union Minister of Youth Affairs and Sports, Col. Rajyavardhan Singh Rathore and the latter is the daughter of a Bhopal fisherman, Kailash. In one of the more poignant stories, Anjali Choudhary (Haryana) was left ruing her luck after she ran short of ammunition in the girls Under-21 25m sports pistol final, no thanks to an extended shoot-off, lasting over 20 shots, with Maharashtra’s Abhidnya Ashok Patil. She managed three hits with the four cartridges she was left with in the end. There is no knowing what would have happened if she had that fifth cartridge. Eventually, ace marksman Jaspal Rana’s daughter Devanshi Rana (Delhi) ran out a 24-23 winner, having arrested a meltdown in the latter half of the dramatic final. There were other moving accounts of Sartaj Singh Tiwana (Punjab) training only twice a week but showing potential to win the 50m 3-position event for boys Under-21. Similarly, G. Varshaa, who won Tamil Nadu’s only gold medal in the ranges, also does not get to train often but displayed grit, determination and good marksmanship to win the women’s 50m 3-position final.